I couldn't tell you when I started to love Monty Python, it's always been on my radar. I spent several rainy weekends watching Monty Python's Flying Circus on Boston PBS WGBH, struggling to get through endless fundraisers and wondering why anyone would pay $50 for a tote bag. They introduced me to Silly Walks, and that "Nobody expects the Spanish Inquisition!" They earnestly sang about cross-dressing in "The Lumberjack Song" and taught all about Dead Parrots but the Galaxy Song has got to be my all-time favorite. When I saw that the 4th Iron Craft Challenge was to create something inspired by a movie or tv show or something to wear on the red carpet, I knew right then what I was going to make. I can not spend more then $10 if I have to buy something. It has to be something that I can use or gift. At least 1 project a month needs to be something new to me, a new pattern, material or technique. 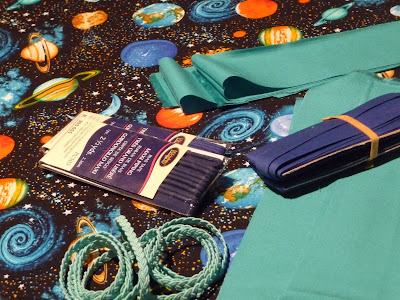 I went to my local Hobby Lobby for the galaxy print fabric and found this really great teal-y blue. 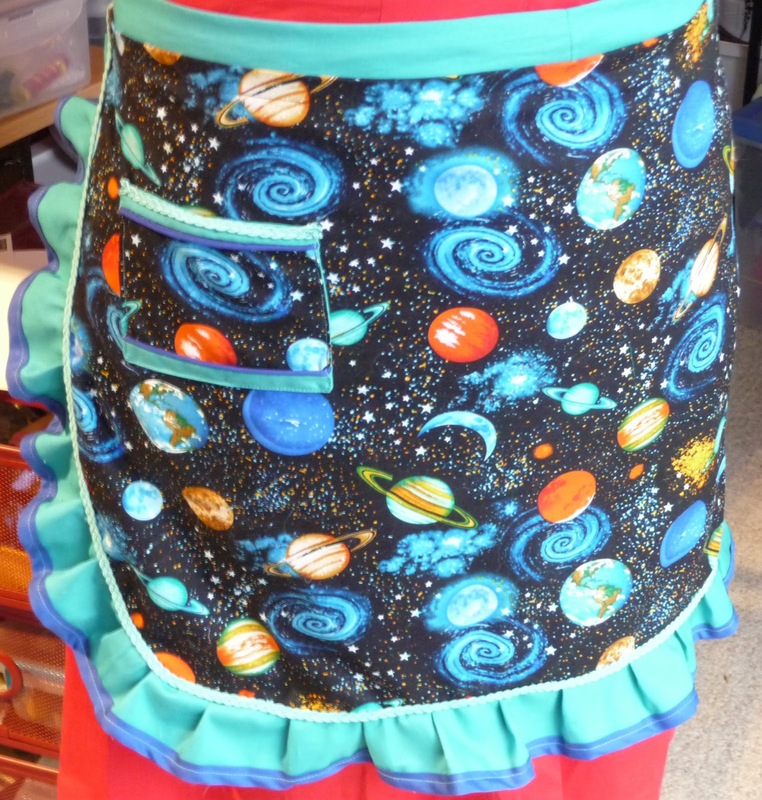 I had all the trim already in my stash and after checking out pinterest for some apron styles went to work. 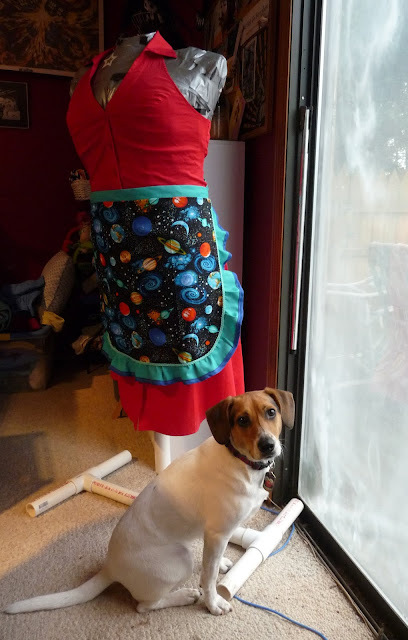 I started off by measuring my waist(A), and then how long I wanted the apron to hang(B). I then cut a rectangle using 1/2A for the width, and B for the length. I folded it in half width wise and rounded off the corners. In fact I rounded off the corners a few times until I go the shape I wanted. I cut 2.5 inch strips for the ruffle, stitched them together, and then edged it with royal blue double fold bias tape from my stash. Using my three fingers as a guide I pleated the fabric every 2-ish inches, pinning it as I went. I will admit to pleating a the first few inches at least 3 times, working out how big they should look. Once I had it adjusted to my liking, I stitched it, and then pressed it down. I took the trim (also from the stash), and lined it up on the seam and top-stitched it all down together. The ties were surprisingly the easiest part, I took a very long 3 1/2 inch strip and folded it in half with the right sides together, stitched it down and using a safety pin flipped it inside out. 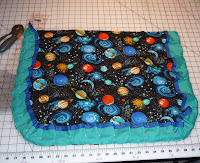 A quick press with the seam in the back and I had a very long tube. I centered the tube with the middle of the apron, right sides together about an inch from the top, and stitched it down. Another quick press and then I top stitched it all down and added a embellished 5x6 pocket. I loved this project, it came together really quickly. I think it took about 2 hours tops and that's with running herd on Oliver, the cutest monster puppy ever. I used up my stash, tried something new, and it's something that I needed but didn't have. While I did have to buy the fabric, using a coupon it cost under $5.00 for both half yards. So I made it under budget as well. 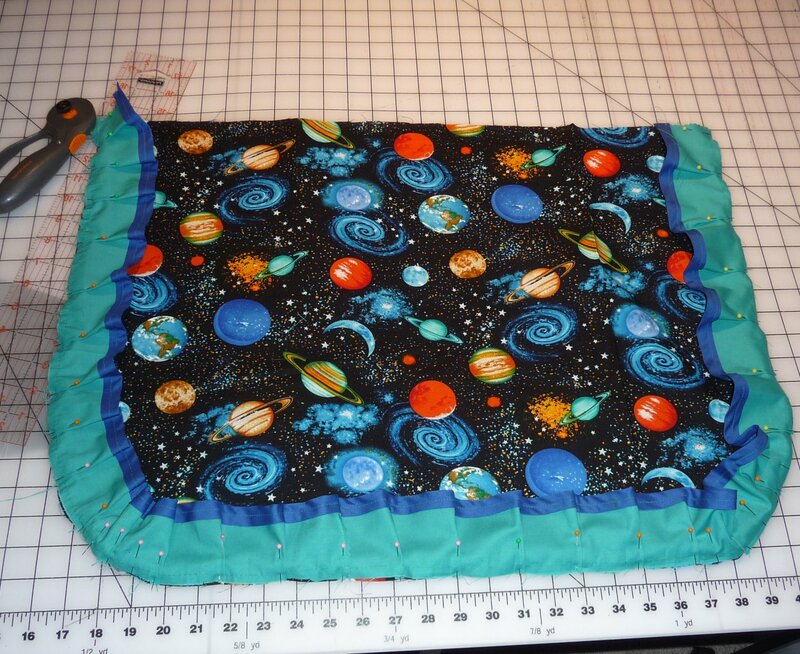 I have enough of that fantastic universe print to do something small, maybe a potholder? The only regret I have, (and it's very minor,) is that I wish when I'd attached the ties I'd put in a few pleats, just to give it a bit more shape. Other then that, I couldn't be happier with how it turned out. Of course I've had the Galaxy song stuck in my head since I finished last week, but it's a small price to pay. How fun! I never thought of Monty Python as an inspiration, there has to be a lot of ideas there. 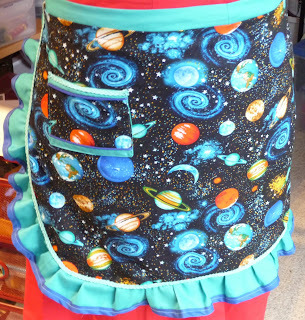 **Love, love, love both the apron and the dress. Great colors, too. A crafty geek girl with a love for Star Wars & my sewing machine, Joss Whedon & my hot glue gun, fairy tales & comic books. I've never met a can of spray paint I didn't like. As a former manager of a New England comic book store, I now live right outside of Georgia and love that I haven't had to shovel snow in the last 6 years.